Congratulations to Bert Blyleven and Roberto Alomar for being voted into the Hall of Fame. A great honor for two deserving players. Of course I also want to send my best to Rich, who I am sure is also enjoying Wednesday's news. If you haven't already please read Sully's post from yesterday. Last year's I ran a piece looking at BBWAA vote histories for players with similar first-year vote totals to first-year players on last year's ballot, and I will do that again here. This is not meant to be a sophisticated projection of the future. 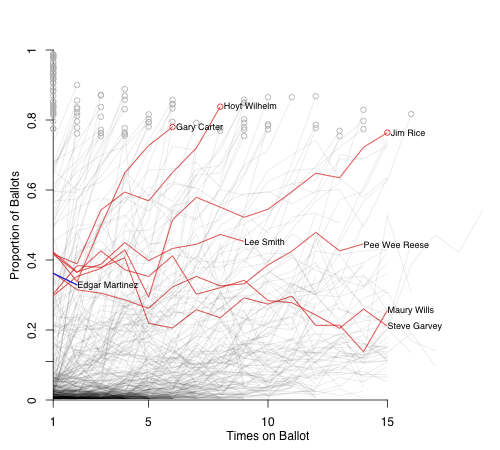 Folks like Chris Jaffe of the Hardball Times have a good handle on the dynamics of HoF voting and the future ballot composition to make better prediction. This is more of a rough look at historical precedent. First off we have Jeff Bagwell who was on 41.7% of the ballots. Here are the BBWAA votes histories for other players who received between 46.7% and 36.7% of the votes their first year. There are a total of seven players, four of whom were elected to the HoF by the BBWAA sometime between the fifth and ninth ballot. Lee Smith is still on the ballot, but it is doesn't look too good for him. Jim Bunning came very close on his 12th year, but then lost support and was inducted by the Veterans Committee. Steve Garvey never made it. Jaffe thinks this is a good start and notes that Garvey is the only player not currently on the ballot to have received over 31% on his first ballot and not be elected. Craig Calcaterra is not as sanguine. He thinks the PED moralists will keep his total down; Mark McGwire has not seen any movement in his total — though McGwire has much more of a PED connection than Bagwell. In addition, as Rob Neyer notes, there is just an insane amount of talent coming on the ballot in 2013-2015. 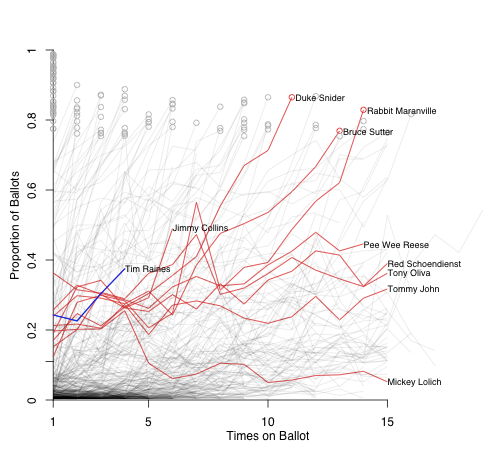 Writers usually do not like to vote for too many guys at once, the Harvard Sports Analysis Collective notes that even though talent fluctuates between ballots the average number of players on per ballot is roughly constant. 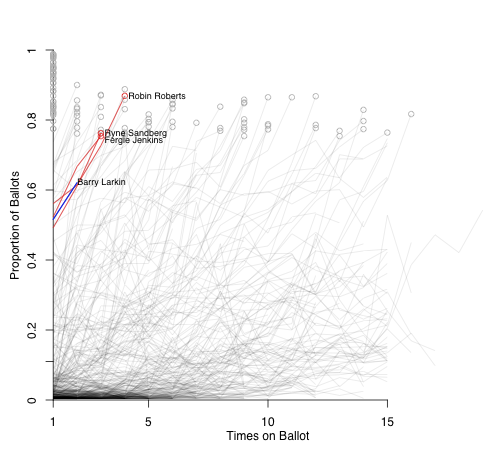 Unless Bagwell makes a huge jump next year — in a weak 2012 ballot — it gets rough starting in 2013. Larry Walker got 20.3%, here are the players who received between 22.8% and 17.8% on their first ballot. One guy in this group made it through the BBWAA vote; Roger Bresnahan made it through the Old Timers Committee; Red Schoendienst through the Veterans Committee; three guys are still on the ballot; and then three others never really broke 40%. Given the talent that is coming on the ballot it is hard to see Walker having a Don Drysdale-like rise to induction. After that you have Rafael Palmeiro at 11%, Juan Gonzalez at 5.2% and a host of guys below the 5% cutoff. There is not much interesting to see with their comps. Instead I will turn my attention to a couple of guys who have been on the ballot for a couple of years and look at comparable players based on multi-year data. First off is Barry Larkin. Here are the three players who were within 5% of both his first year (51.6% last year) and second year totals (62.1% this year). Things look good for Larkin. Ryne Sandberg and Fergie Jenkins made it on the next ballot while Robin Roberts on the one after that. It really seems like 2012 is Larkin's year, given his strong vote totals in the past two years and the weaker group of first-timers on the 2012 ballot (Bernie Williams is probably the best guy on the ballot). Next up is Edgar Martinez, also a second-year guy. He saw a drop from 36.2% to 32.9%. Here are the players within a 7.5% of both of those totals (I had to make a bigger envelope to get a good number of players). Three guys made it through the BBWAA votes; Pee Wee Reese got in on the Veterans Committee; Lee Smith is still on; and two guys didn't make it. Given the guys coming, Martinez's role as a DH, and his drop in vote share it does not look good for Martinez. I think this comparison group probably overstates his chances. Here is Mark McGwire. 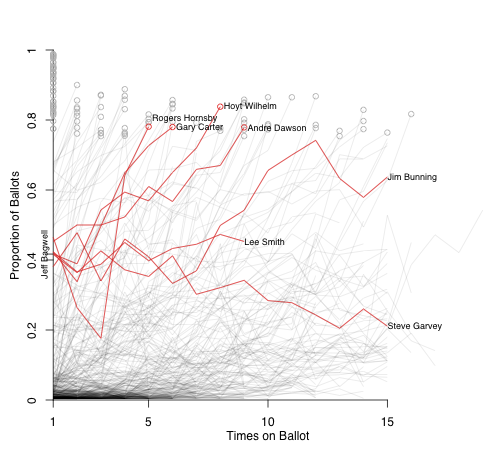 His numbers have held fairly constant over the first five years on the ballot. 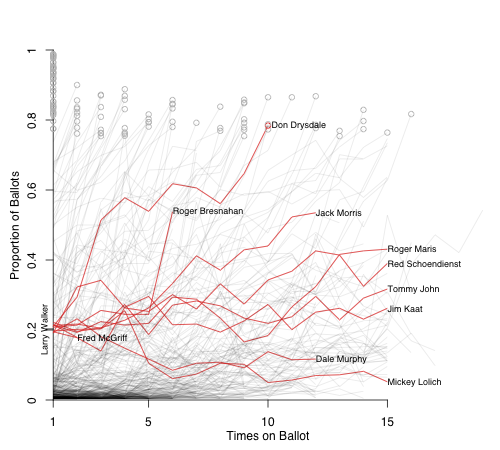 I had to widen range to those within 10% of the five ballots to match up a big enough pool to McGwire. Things don't look too good. Bresnahan and Jimmy Collins had big jumps in their BBWAA numbers and were inducted by the Old Timers Committee; Jack Morris and Dale Murphy are still the on the ballot; and then you have six guys who never got past 40%. Unless there is a sea change in how the voters view the PED issue I think these six guys are a pretty good guide for what McGwire's time on the ballot will look like. Finally I will look at Tim Raines' numbers. The comps here didn't work out as well. I had to extend the window to 12.5% and even there I don't think it is a great group. The group matches Raines over the first three years, but in year four they are all below Raines (through all years they are still within the 12.5%). This shows the limitation to this comparison method. Raines has had a good couple of years, from a low point in 2009 of 22.6%, to 30.4% last year, and then 37.5% this year. So he is moving in the right direction. If there is anyone else you would like to see? Or do you have any suggestions for the graphs? If so mention them in the comments. 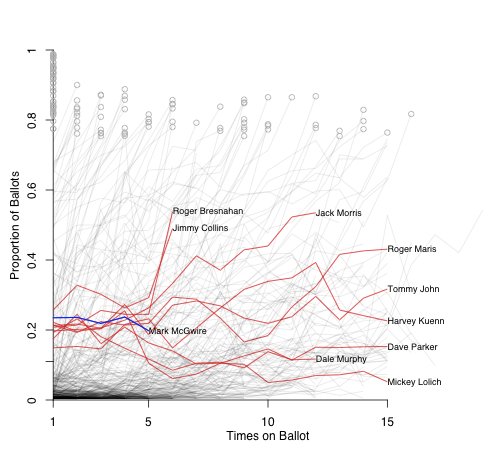 How about a graph of all the guys who spent 15 years on the ballot (assuming there is a large enough number of those guys to make for an interesting graph)? Whoops, I guess the graphs above show that there are probably way too many of those guys to show them all clearly on one graph. Absolutely love the visual. What might help make them more user friendly is providing a reference line at 75% so folks can immediately see who was elected by the writers. You could also color code inductees so, again, you could easily see who is in via Vet Committee and who via BBWAA. You explain it all below the visuals, but the whole story could easily be told with the graphic. Yeah there are lots of guys who have been on the ballot for 15 years. Here is a graph with those players highlighted. I had to make the names smaller because they overlap so much, and they still overlap. 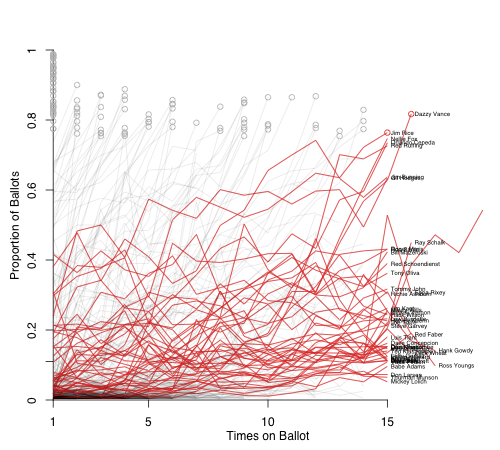 It looks like at some point players spend more than 15 years on the ballot. Good point about the reference line. I forgot to mention, but when someone is inducted I put a little circle. I think you are right that maybe a reference line might be a better way to show it. Color coding the Veterans Committee inductees is also a great idea, that way the graphs would really stand on their own. If Larkin deserves to be in the HOF (and he certainly does), what about Alan Trammell, who has virtually identical career stats as Larkin? While Larkin admittedly was a better base stealer than Tram, the rest of the numbers are like a pair of Siamese twins. One suggestion. Maybe it would be more salient if you omitted players who were first on the ballot prior to 1954, when the ballot consisted of players who had been retired for at least 5 years. I don't think the balloting trajectories of players who first appeared before this time point has any relevance to the modern day voting procedures. E.g., Joe DiMaggio and Hank Greenberg first appeared on ballot in 1945 and respectively received 0.4% and 1.2% of the votes. Their first HoF votes, obviously received while they were in WW2, shouldn't really count in your trajectory comparisons. The current HoF voting procedures actually started in 1967 (voting annually, 15 year and 5% cutoffs), but perhaps that would cause too few data points, so I can make peace with limiting to those who first made ballot in 1954. Larkin definitely had much better discipline at the plate, and it shows in that he was closer to a .400 OBP throughout his career than Tram was. Tram's slugging was also considerably lower than Larkin's. I don't see twins at all. Offensively, I would rank Larkin first, Ripken second, and Tram third from those three. All three had various differences in their games, but I believe Larkin and Ripken were just a few steps ahead of Trammel, and there has to be a cutoff point somewhere.